Written for practitioners and policymakers, this book will help professionals across health, education, social care and juvenile justice services to understand the needs of young offenders and adolescents at risk of entering the criminal justice system. 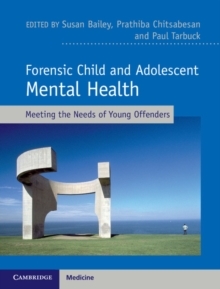 Developmental in approach, the textbook provides a comprehensive overview of forensic child and adolescent mental health, using cases to help clinicians link theoretical principles to practice and understand how mental health and neurodevelopmental impairment can relate to offending behaviour. With an emphasis on preventive initiatives, early intervention and the building of psycho-social resilience through the delivery of values based practice, this book highlights the need for comprehensive assessment for young people across multiple domains of their lives. This book is of interest to all clinicians working within mental health teams, practitioners working with children and adolescents, professionals involved with youth justice and medico-legal issues, and politicians responsible for establishing health and social policy.